SAN Miguel simply proved too good, too strong for undermanned NLEX, 125-114, on Saturday as it moved up to fifth spot in the PBA Commissioner’s Cup at the Calasiao Sports Complex in Pangasinan. June Mar Fajardo finished with 30 points and 13 rebounds while Renaldo Balkman had 25 points and 16 rebounds for the Beermen, who improved to 5-4 following the breezy victory. San Miguel's win spoiled an herculean effort from NLEX import Arnett Moultrie, who had 43 points and 14 rebounds but couldn't save NLEX from falling to its fourth straight loss. At 2-8, the Road Warriors bowed out of the quarterfinal race. 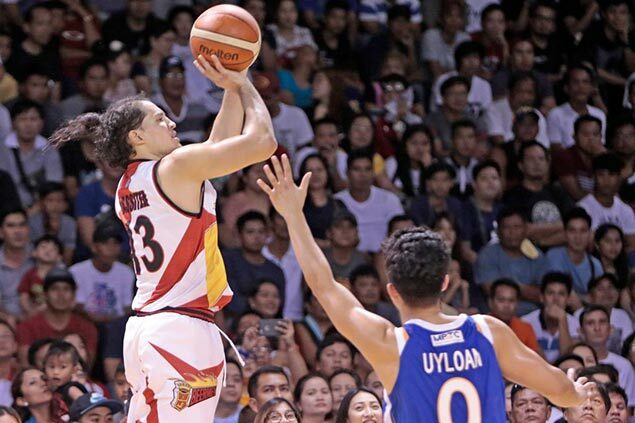 Marcio Lassiter scored all of his 26 points in the middle quarters when the Beermen took control of the game for good. The Cal-State Fullerton standout had 11 points in a 14-3 run that put the Beermen up, 65-55, at halftime. Lassiter then continued to fire away in the third canto, scattering 15 in that stretch, doing just enough to fend off a Moultie-led Road Warriors fightback. Lassiter nailed six of his nine shots from downtown, making 10 of 17 shots all in all. Alex Cabagnot added 17 points and five rebounds as Chris Ross added 12 points and eight assists. The loss for the Road Warriors also put to waste Asi Taulava's hot shooting as the 45 year Fil-Tongan made five of his eight attempts from downtown. He also had nine boards in 17 minutes as a starter.